2 Bedroom Semi Detached House For Sale in Horsham for Guide Price £575,000. A beautiful attached Listed cottage in a village setting, offering many fine period features. The property offers well-proportioned rooms throughout and would make the ideal downsize or country move. As can be shown on the attached floor plan, this accommodation includes a wonderful beamed dining room with deep inglenook fireplace, a fitted study, wc, bay fronted sitting room with attractive sash windows, and to the rear a lovely country style kitchen breakfast room with AGA and utility room. A useful cellar is accessed from here via a trap-door. The first floor provides two spacious double bedrooms and a bathroom with a view over the gardens. The second bedroom gives access, via a pull-down set of steps, to a loft room which is plastered and decorated offering a number of potential uses. 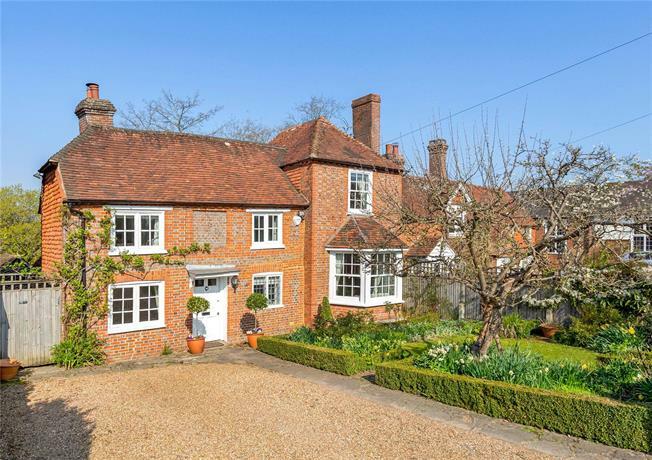 The property is situated in this popular village on the Surrey/Sussex border, with local and private schooling, doctor's and dentist surgery and everyday local store/post office. Rudgwick is situated approximately 12 miles south of Guildford and 6 miles north of Horsham both having a comprehensive range of shopping and leisure facilities and mainline stations to London. Nearby Cranleigh also offers a wide range of shops and a leisure centre. The property sits within delightful cottage gardens, with parking for up to 4 vehicles at the front on a shingled driveway. A garden sits beside the parking with pretty flower and shrub borders set within attractive box bay hedging. To the rear there are several fruit trees including plum and pear. At the foot of the garden there is a well maintained kitchen garden with soft fruits and vegetables and a delightful established brick wall forming the boundaries on two sides. An attractive outbuilding, near the house provides a workshop and home office with power and light and telephone point.